For more than 40 years, the Texas Veterinary Medical Foundation (TVMF) has been caring for animals, educating community members and supporting veterinary professionals throughout the state of Texas. While the Foundation was established as the philanthropic partner of TVMA, many people remain unfamiliar with TVMF’s mission and programs. Caring for Animals, which means advocating for responsible animal ownership and educating the public about the importance of veterinary care for their pets. Advancing the Profession, including providing support to veterinary students through awards and grants and supporting select programs/projects that advance the art and science of veterinary medicine. Serving the Peoplethrough the public relations and philanthropic functions of the veterinary profession and providing a contingency fund for disaster and emergency relief for the treatment of animals. The programs managed by TVMF in partnership with other community collaborations provide many benefits for pet owners across the great state of Texas. TVMF Trustees Roddy Riddles and Tyler Anderson recently spoke about the impact these programs are having for communities statewide. “We see the impact of TVMF all the time, whether in providing disaster assistance to veterinarians impacted by fires, hurricanes and other events or grants and scholarships to veterinary students or financial aid and education for pet owners in need,” Anderson said. Both Riddles and Anderson were introduced to the Foundation by Texas Veterinary Medical Association members. “As a territory manager for an animal health distributor calling on veterinarians, I was reminded by several of them of the outstanding work the Foundation was doing,” Riddles said. It wasn’t until TVMF Immediate Past President Dr. Scott Mellina personally asked Riddles to serve on the board that he accepted the invitation. After researching more about TVMF, Riddles became convinced that its mission was exactly what he was aiming for in the field. Dr. Deborah Besch, Anderson’s wife, introduced him to TVMF. Riddles and Anderson both commented that they have enjoyed seeing TVMF grow and become more professionally managed. TVMF PALS (Pets Assisting the Lives of Seniors) is a TVMF program that provides fundamental health care for pets belonging to homebound community members. With more than 200 clients and companion animals on the waiting list, TVMF and program volunteers work tirelessly to accommodate the growing number of homebound neighbors who need help caring for their beloved companion animals. This program is operated in partnership with community collaborations in Austin, Bryan/College Station, Dallas, Houston and Abilene. Undeniably, TVMF relies on the generosity of many volunteers, including veterinary professionals and the TVMF Board of Trustees. It is not uncommon to see a trustee chauffeuring a precious pet from their homebound family’s residence to a volunteer veterinarian’s clinic for a wellness exam or some other type of emergency treatment. These veterinary professionals, community members and TVMF leaders are unafraid of digging into the trenches to ensure programs like TVMF PALS are making a difference for pet owners. Partnerships and community collaborations like these are the heart of TVMF’s mission to promote animal wellness and strengthen the human-animal bond. “I like that the mission of TVMF is multi-faceted—support for the veterinarian community, pet owners and the general public in many different ways,” Anderson said. Equally important to TVMF’s dedication to caring for animals, educating pet owners and strengthening the human-animal bond is the Foundation’s third mission area, which reflects a commitment to serving people through support of veterinary science and medicine. Every year, TVMF awards more than $30,000 to various activities in support of students at the Texas A&M University College of Veterinary Medicine and Biomedical Sciences, including stethoscopes to first-year veterinary students, student club sponsorships and student veterinary science research programs. Additionally, students may apply for emergency assistance grants that can help them get back on their feet after an unexpected life challenge, such as the theft of a laptop or loss of personal property. TVMF also lends assistance to veterinarians through programs such as the Rusk Veterinary Grant Program, which provides financial assistance for families whose pets are in crisis, and the Disaster Relief Fund, which veterinarians may use to help community members and animals affected by natural or human-caused disasters. In partnership with TVMA, the Foundation is uniquely positioned to help when veterinary professionals themselves need help. The generosity and caring spirit of the TVMF/TVMA community, and the nation for that matter, was never more apparent than when veterinary professionals from all over Texas rushed to the aid of a colleagues who were impacted by Hurricane Harvey. These are just a few of the programs the Foundation employs to accomplish its mission, which continues to impact animals, pet owners and veterinary professionals throughout Texas. These programs are currently some of the best-kept secrets within the veterinary community, but hopefully this will change. TVMF needs help to spread the word about the Foundation’s mission and programs. 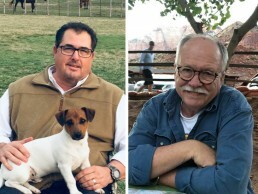 Riddles and Anderson encourage others to join the Foundation’s efforts and help preserve the celebrated human-animal bond and all it represents.